The word derives from the French verb "restaurer" ("to restore", "to revive") and, being the present participle of the verb, it literally means "that which restores". The term restaurant was defined in 1507 as a "restorative beverage", and in correspondence in 1521 to mean "that which restores the strength, a fortifying food or remedy". The first use of the word to refer to a public venue where one can order food is believed to be in the 18th century. In 1765, a French chef by the name of A. Boulanger established a business selling soups and other "restaurants" ("restoratives"). 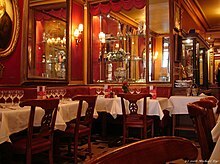 Additionally, while not the first establishment where one could order food, or even soups, it is thought to be the first to offer a menu of available choices  The "first real restaurant" is considered to have been "La Grande Taverne de Londres" in Paris, founded by Antoine Beauviliers in either 1782 or 1786. According to Brillat-Savarin, this was "the first to combine the four essentials of an elegant room, smart waiters, a choice cellar, and superior cooking". In 1802 the term was applied to an establishment where restorative foods, such as bouillon, a meat broth, were served ("établissement de restaurateur"). 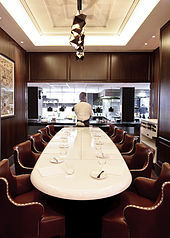 In the early 19th century traiteurs and restaurateurs, became known simply as "restaurateurs". 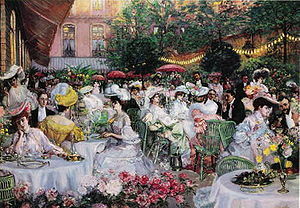 The use of the term "restaurant" for the establishment itself only became common in the nineteenth century). ^ Prosper Montagné. "The New Larousse Gastronomique". Éditions Larousse. p. 97. Retrieved February 22, 2019. ^ "Etymology of Cabaret" (in French). Ortolong: site of the Centre National des Resources Textuelles et Lexicales. Retrieved January 12, 2019. ^ "Marcus". Accessed May 21, 2015. ^ "Business economy – size class analysis – Statistics Explained". Epp.eurostat.ec.europa.eu. Retrieved May 2, 2013. ^ Phillips, Matt (June 16, 2016). "No one cooks anymore". Quartz (publication). Retrieved April 5, 2017. ^ Abrams, Rachel; Gebeloff (October 31, 2017). "Thanks to Wall St., There May Be Too Many Restaurants". The New York Times. Retrieved November 1, 2017. ^ Danny May; Andy Sharpe (2004). The Only Wine Book You'll Ever Need. Adams Media. p. 221. ISBN 9781440518935. West, Stephen H. (1997). "Playing With Food: Performance, Food, and The Aesthetics of Artificiality in The Sung and Yuan". Harvard Journal of Asiatic Studies. 57 (1): 67–106. doi:10.2307/2719361. JSTOR 2719361. Kiefer, Nicholas M. (August 2002). "Economics and the Origin of the Restaurant" (PDF). Cornell Hotel and Restaurant Administration Quarterly. 43 (4): 5–7. doi:10.1177/0010880402434006.